Chicago Forklift Certification, Get Started Today! As one of the largest cities in the U.S., Chicago is an efficient economic powerhouse for an extensive diversity of industries. 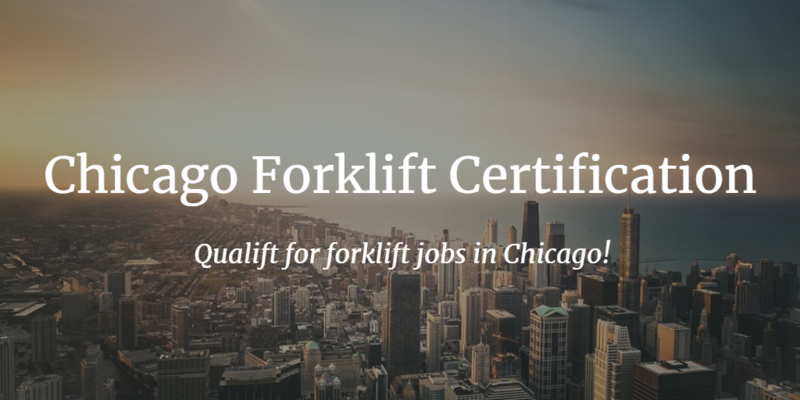 Home to more than 400 major corporation headquarters in manufacturing, technology, logistics, construction and many other industries, Chicago offers a broad range of employers seeking certified forklift operators. Job opportunities for forklift operators in Chicago are in high demand with the U.S. Bureau of Labor and Statistics reporting a growth for industrial forklift operators to increase by 12 percent by 2020. By completing Chicago forklift training, you’ll receive a forklift certification to begin benefiting from a stable and rewarding career. With a Chicago forklift certification, you’ll earn a median annual salary of $27,000 that can exceed $40,000 annually as your career progresses. Select a training package to get started! What kind of forklift certification in Chicago do I need? Chicago forklift training teaches the safety guidelines and regulations required by employers to ensure the safe and effective operation of a forklift while meeting specific guidelines enforced by state and local agencies. With forklift training, you’ll meet OSHA standards through comprehensive online training that’s compliant to forklift operational guidelines. Depending on your forklift job (trainer, safety coordinator, forklift operator, etc. ), you can choose the FLC forklift certification in Chicago that fits your role. Thanks to our customized forklift training in Chicago, anyone can receive professional, OSHA-approved instruction. And best of all, your FLC training makes you an ideal candidate for forklift operator jobs in Chicago and throughout Cook County! Why do I need a forklift certification? Active warehouses and factories depend on forklift operators to deliver and distribute various items to maintain the function and performance of the facility. Employers seek those with Chicago forklift training and certifications to safely perform these tasks. Forklift drivers for both small gas-powered forklifts and large-scale hydraulic models are in high demand to safely maneuver the forklift to stack and retrieve heavy objects both inside and outside of facilities. Drivers must place a high importance on the safe operation of forklifts to reduce the risk for forklift-related injuries in the workplace. Chicago forklift certification is the best way to be prepared to recognize a number of hazards involving a forklift and the surrounding area. And it turns out, forklift accidents are more common than previously thought. A new report from OSHA reveals that more than 10,000 serious injuries occurred in 2015. Among the 10,000 cases were 2,644 amputations and 7,636 hospitalizations. According to the Chicago Tribune, in 2012, a military veteran who served two tours in Irag was seriously injured when he was hit by a forklift while working at the McCormick Place in Chicago. Thomas Neuhengen, 33, lost his heel and had to endure seven surgeries to repair his left foot which was crushed due to the accident. Neuhengen was working the teardown of the 2012 International Manufacturing Technology Show, and the company that set up the show, Global Experience Specialists, failed to confirm that the forklift driver who hit Neuhengen had completed forklift certification in Chicago. Neuhengen was eventually awarded $15.2 million from the lawsuit against the forklift operator’s employer, although, he will have to live the rest of his life without the ability to walk like he used to. Protect your own safety, whether you are operating the forklift or working near one, and protect those around you with comprehensive forklift training in Chicago. Among Chicago’s top industries are construction and manufacturing, which employ over 550,000 people. Both industries rely on experienced forklift operators to promote business performance. Chicago is also home to large logistics and transportation companies, like Coyote Logistics, FedEx and W.W. Grainger, as well as manufactures and distributors, including Reyes Holdings LLC, U.S. Foods, Medline Industries Inc. and Ace Hardware Corp. The city’s diversity of industries allows for limitless job opportunities for those with a Chicago forklift certification. Class 1: Electric Motor Rider Trucks—site down rider electric, stand up rider counterbalanced electric. Class 4: Internal Combustion Engine Trucks, Cushion Tires—sit down rider fork gas or LPG, fork, counterbalanced. Class 5: Internal Combustion Engine Trucks, Pneumatic Tires—site down rider gas or LPG, fork, counterbalanced. Class 2: Electric Motor Narrow Aisle Trucks—high-lift straddle, order picker, reach type outrigger, side loaders, turret trucks, swing mast and convertible turret/stock pickers, low lift pallet and platforms. Class 3: Electric Motor Hand or Hand/Rider Trucks—low lift platform, low lift walkie pallet, reach type outrigger, high lift straddle, high lift counterbalanced, low lift walkie/ricer pallet. Class 7: Electric and Internal Combustion Engine Tractors—sit down rider class 7, straight mast forklift, extended reach, telescopic, extended boom, and straight mast rough terrain forklifts. For only a total of $299, you will have complete access to all of our forklift training in Chicago, or you can pay just $59.95 for each module by itself. In our forklift certification Chicago programs, you will learn how to drive a forklift, assess the workplace, inspect physical conditions, maneuver ramps and grades, avoid accidents, and find forklift jobs in Chicago. The Next Step: Sign Up with FLC Today! It’s hard to ignore the benefits that come with FLC’s forklift training in Chicago. And it’s impossible to ignore the severe consequences that come with not getting your Chicago forklift training classes. Add it all up, and FLC is your best option for getting certified quickly and affordably. Each training session covers all the critical OSHA safety standards, so you’ll be prepared for whatever comes your way. And best of all, our forklift training classes in Chicago travel with you throughout the United States. Once you have your forklift certification in Chicago, you’re good to go in all 50 states! How to receive a Chicago forklift certification? Receiving your forklift certification in Chicago is simple and affordable when choosing ForkliftCertification.com. We offer comprehensive online training that’s OSHA compliant to obtain a forklift certification. Contact ForkliftCertification.com to get started today! Forklifts are used all over Chicago every day for numerous projects. Although, they don’t come without their share of accidents. Forklifts can be dangerous pieces of equipment if placed in the hands of an untrained operator. Forklift certification in Chicago is the best way to reduce the number of fatal injuries that occur every year. To complete your forklift training in Chicago and do your part to save lives on worksites, read more about ForkliftCertification.com and their courses here.